I was in the kitchen with a friend once, making dinner and throwing this and that into the pan when while she stared at me incredulously before asking “how do you know you can put those things together?” Simple, I replied, it tastes good in my head. Regardless of whether or not I’m cooking from a recipe I usually have a pretty good idea of what the final dish will taste like long before it’s on the table. I know what flavours I like so I figure I can’t go wrong by putting those together. That’s what happened when I made up the marinade for these ribs. Originally I was planning on making honey garlic ribs, (because anyone who’s anyone likes honey garlic ribs) but then I wanted to jazz them up a bit so I started rummaging around in the fridge to see what else I could add to honey garlic. Well I found all sorts of stuff and as I sloshed more and more into the marinade, I could taste the flavours coming together. You can too if you combine all of the ingredients below and pour them over a rack of pork side ribs. Turn to coat the ribs and then let them marinate for at least 3 hours or preferably overnight. Remove the ribs from the marinade and reserve the liquid. Put the leftover marinade into a small saucepan and bring to a boil for at least 5 minutes. 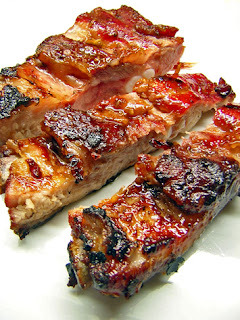 Then heat up your grill to low and let the ribs cook low and slow, basting periodically with the marinade, particularly at the end of the cooking time. These ones took almost 4 hours. Usually when I make up my own marinade I don’t measure or write down ingredients but I had a feeling that this would be a good one and it was. I will definitely be making it again, especially for a honey garlic rib lover. **This article can also be seen on the Well Fed Network and Get Your Grill On. Posted by Brilynn at 3:47 p.m.
Those ribs look so good! The marinade sounds tasty. You're my kind of cook. Yum! I think that marinade would work well for chicken, too. The ribs look perfectly lacquered and delicious looking. Yum. You know ribs are one of my all time favourite foods...great stuff Brilynn! this looks and sounds wonderful!